Experience Sony Pictures is a free Windows 8 movie app that gives you information on almost every movie and television show produced by Sony Pictures Entertainment. You can watch the trailers and photos of the upcoming movies, as well as the movies which have already been released. Besides that, you can also find the nearby theaters, theaters around a specific location, and buy tickets for movie shows. 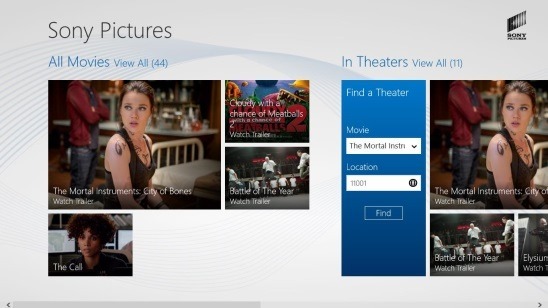 This free Windows 8 movie app also lets you buy movie DVDs that you can watch at home. If you are a movie fanatic, then this is a must have app for you. 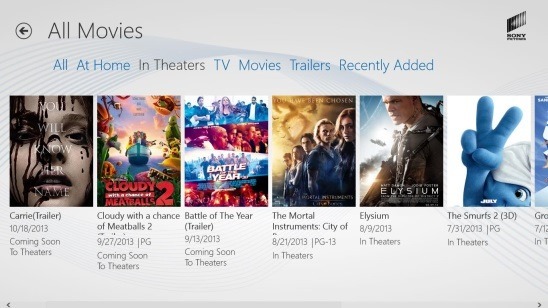 This Windows 8 movie app is present under the Entertainment Category in Windows Store. You can also use W + Q keys combo to find the app. Experience Sony Pictures is the official client app of Sony Pictures and is published by Sony Pictures Home Entertainment. The app is well designed, and it totally looks like a movie app. You’ll realize this the moment you open the app. It has got good image rich UI and switching between different screens is smooth. Working with this app in full screen is pretty easy and good experience. The UI is pretty clean as there are no annoying ads. There are multiple categories that helps in browsing for movies, and in a way they also filter the movies list. The various categories present in this free Windows 8 movie app includes: At Home, In Theaters, TV, Movies, Trailers, Recently Added, and All. Simply click on the requisite category, and you’ll get all the movies listed under that particular category. I liked the way the app list down the movies under each category. There are big tile posters of the movies, plus it also shows the release date, motion picture rating(either PG, PG13, and R), and the availability of the movie (coming soon, in theaters, etc.) at its cover. Simply click on the cover and you’ll get directed to the movie’s screen, which contains an overview of the movie and buttons to watch the trailer, photo gallery, add to favorites, and share with Facebook friends. Two more buttons: Purchase Now and Find a Theater Now!, depends on the availability of the movie. That is, if the movie is a new release then you’ll get Find a Theater Now! button, and if it’s released some time back, then you’ll get a Purchase Button. 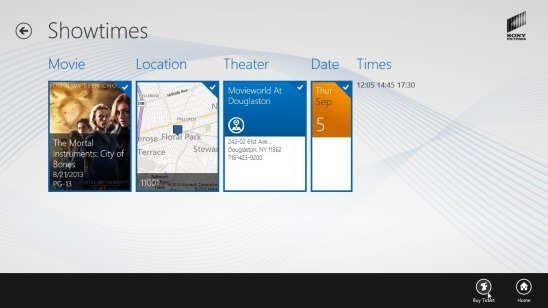 I also liked how this free Windows 8 movie app provides you multiple ways to find a theater’s location. By default it uses your location to find the nearby theaters, but you can also find the theaters for a particular area by entering the zip code. One should know that this feature is useful only for the people living in United States, because it finds theatres only for the cities of United States. The theater search works pretty well. It finds out a number of theaters that you can go to as per your convenience. Like I said before, you can also buy tickets of a newly released movie. Simply select a movie from In Theaters category, click on Find a Theatre Now! button, enter the zip code, select the theater, select the date, and finally click on Buy Ticket Button. That’s pretty much it! Follows a screenshot of watching the trailer of the movie “Carrie” within the app. 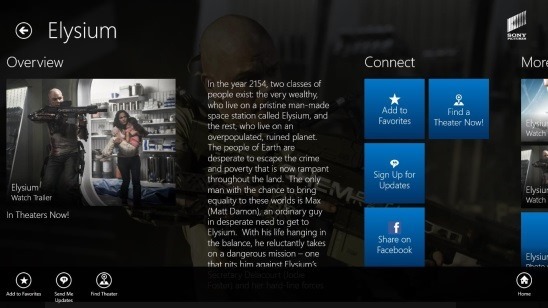 Good Windows 8 movie app. Provide information on movies and TV shows produced by Sony Pictures. Find theater and buy tickets. Buy movies with the app. Mark a movie as favorites. Share with Facebook friends or Share using Share Charm. Follows a screenshot of watching the photo gallery of “This is The End” within the app. Experience Sony Pictures is a pretty good app for being a free Windows 8 movie app. It’s functional, does what it says. Watching trailers and working in full screen with nice background looks cool. Besides that, it’s a great medium to grab the tickets before they get sold out. Surely a good app to try your hands on. Also check out this free Imdb app for Windows 8: Imdb Touch. Get Experience Sony Pictures here.